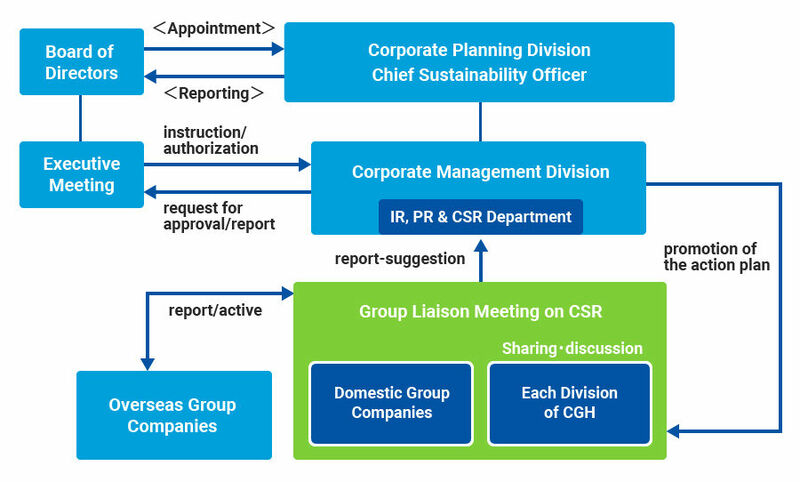 Chiyoda Corporation has introduced the Chief Officer System from April 2018, and the Division Manager of the Corporate Planning Division is appointed by the board of directors as the Chief Sustainability Officer to manage overall CSR and Sustainability matters. Particularly for the matters of compliance, one of the important themes on CSR and Sustainability, the Legal & Compliance Dept. (LCD) is separately established as a specialized organization in the Corporate Management Division. The LCD collaborates with the domestic and overseas group companies to enhance the compliance activities, with the Compliance Committee and Export Control Committee under the direction of the Executive Meeting as well as Group Liaison Meeting on Compliance set up. In addition to the above organizational structure, Chiyoda has also its unique employee voluntary participation system where the employees are registered as ‘CSR Promotion Staff’ to collaborate with the IR, PR & CSR Dept. in promoting the CSR activities as part of their work assignments.